ELIZABETH – RUGBY CEMENT, Barrington Quarries, Cambridgeshire. This locomotive was supplied on the 12th March 1958 to the North-eastern scrayard of T.J.Thompson where it was named ELIZABETH. Later in life it found its way to Barrington where it was a capable performer in the quarry railway bringing loaded tipplers down to the works. 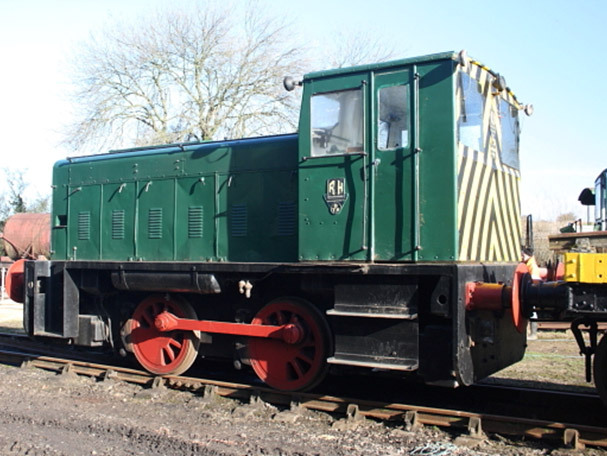 It worked with fellow Barrington loco MR.D until the system closed in 2005 and then being donated to our Museum along with some of the purpose built tippler wagons. The loco is a good operational loco and sees much use on our railway.